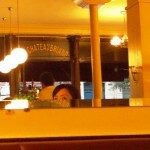 Another hard-to-book table that we miraculously scored in Paris was at Le Chateaubriand. We were famished from running around the City of Lights all day, but this meal was an opportunity that we weren’t about to pass up. They switched out our server for an English-speaking one that was handsome, effortlessly charming, and had a way of speaking about the dishes that made us hang on every word. From my understanding, he was also a chef, but why he wasn’t in the kitchen, I don’t know — too many cooks stirring the pot? 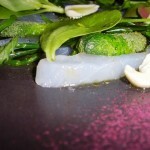 Like Spring and many other restaurants in Paris, they offered a prix fixe menu, and it started with salted raw cod with fresh almonds, cucumber, and mint. The fish was a most appropriate start to the meal, as fresh as any I’ve ever had and paired with elements that only enhanced the flavor of the fish. It was completely refreshing, unlike anything you’d normally associate with French cuisine, but of course, this is Le Chateaubriand where traditional fare is taken apart and put back together in a way that you may not even recognize, but with eye-opening results. 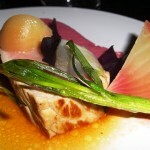 The cod was followed by seared tuna with white lardo, pomme de terre, gingered onions, and dill and then rare veal with golden beets, red beet puree, turnips, purple basil, and spring onions. After our Spring and Le Chateaubriand meals, the unassuming spring onion, unadulterated save for a sprinkle sea salt and oil, became our vegetal obsession. We noticed these spring onions every where, at every corner market and farmers market we strolled by. Huge bulbs of white, crowned with thick stalks of green, spring onions have an even more robust flavor over your average mass supermarket green onion or scallion. We recommend Le Chateaubriand to virtually any friend or acquaintance headed to Paris because we are that that passionate about this not so hidden gem. Even our Parisian girlfriend was surprised of our Saturday evening supper choice. We were seated during the first seating so it made for a nice leisurely dinner, but the restaurant was packed and in full steam by the time we settled our bill. Do make note to call ahead for reservations and get ready to be stunned by your 5-course prix fixe dinner.